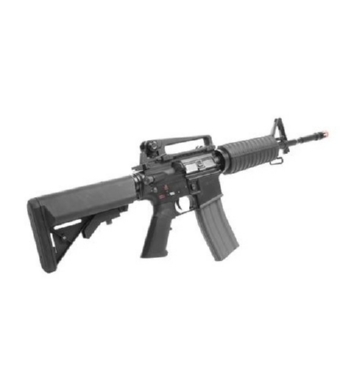 PRODOTTO DALLA G&G (TAIWAN), FUCILE ELETTRICO M4 A1 CARBINE FULL METAL. UTILIZZA BATTERIE TYPE MINI CON ATTACCO TAMIA PICCOLO ALLOGGIABILI NEL PARAMANO ANTERIORE (NON COMPRESE), CARICA BATTERIA NON COMPRESO. GUSCIO IN METALLO, 1 SLITTA WEAVER PER ACCESSORI, MANIGLIONE RIMOVIBILE PER IL TRASPORTO, CALCIO IN FIBRA DI NYLON REGOLABILE, SPEGNIFIAMMA IN METALLO.